Elvis Presley kicked the bucket on this day in 1977. 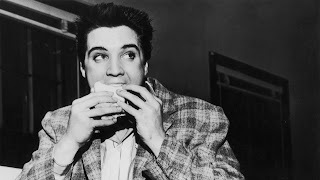 Sure, there are some people who would argue that "The King of Rock & Roll" actually faked his death but since the only Elvis sightings I ever heard about were at a Denny’s or a Burger King and not at a health club or a Whole Foods, I’m guessing that even if he didn't die back then he’s probably gone by now. I like to keep things positive so I don’t want to dwell on the fact that on this day 38 years ago one of the greatest entertainers of all time dropped dead on the toilet at the relatively young age of 42. And because of this blog’s subject matter I don’t want to talk about Elvis’ music, his movies, his karate, his jumpsuits, his massive drug use or even that time he talked President Richard Nixon into deputizing him into semi-official narc-dom. What I want to talk about is Elvis’ own very special junk food jones. Come to think of it, I don’t just want to talk about it, I want to live it so today I vow to Eat Like The King! Elvis loved him some bacon so that’s what I’m having, and plenty of it. In fact, Elvis liked to snack on the stuff all day long. He insisted on having bowls of bacon sitting around on just about every flat surface in Graceland. I guess that means I’m doing it, too. Bowls of bacon, man. Bring it on! Bacon! Man alive, ol’ Elvis was onto something here. 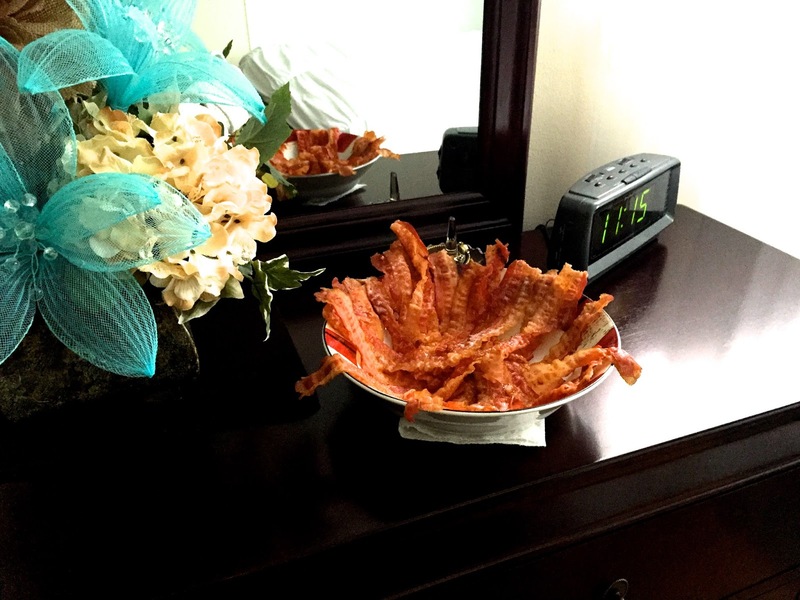 A bowl of bacon in every room. Bacon-grazing is the best! Peanut Butter & Banana Sammich! This is the classic. Every hack stand-up comedian who ever made an Elvis joke poked some level of fun at the King for loving these things. I used to be a hack stand-up comedian so I probably did it once or twice my own self. But have I ever tried one? Nope. Not once. It’s time to change that. Gimme a PB&B! The King sometimes liked his banana sliced and sometimes mashed into a paste so I did both. Then I stuck ‘em together and fried the whole thing up in a pan with plenty of butter just the way Elvis liked it. I was skeptical but the warm, melty peanut butter tasted great combined with the banana. My advice is to stick with the slices, though. Go for creamy peanut butter but chunky-style banana. You want the fruit to put up a fight. Banana is more easily overwhelmed by the peanut butter than sugary jelly so remember: Big pieces of banana are your friends. It turns out Elvis was really right about this sandwich. I loved it! Just goes to show that you should never doubt a fat man when it comes to food. Bacon. Again. It’ll take a lot more than a day to burn me out on bacon but I’m not nearly as enthusiastic about it as I was a few hours ago. And it’s cold. But, still… it’s bacon, man. Tough to complain about bacon. Just grab a handful from a nearby bacon bowl and go. Pimento cheese was so common when I was a kid that I was shocked when I couldn’t find it in Los Angeles. I just took the humble mix of cheddar cheese, mayonnaise and pimentos for granted, I guess. Turns out pimento cheese is pretty much just a southern thing. 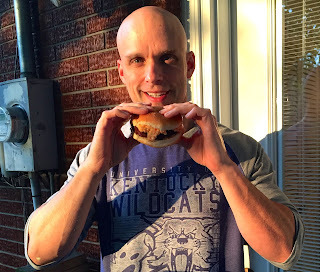 But since I’m eating like The King on a trip back home to Kentucky I was able to snag some so I could try it the Elvis way: On a hamburger. Do yourself a big favor and try a pimento cheese burger immediately. Unless you live in a part of the country where you can’t just go to the store and grab a container of “the caviar of the south.” If that’s the case, then you only have two options: Learn to make it from scratch or move to someplace civilized. Those are really the only choices. I might not go back to Los Angeles now. I think I need at least three pimento cheese burgers a week for the rest of my life. Elvis said, “The input has got to be as great as the output.” That’s the way he rationalized what (and how much) he ate. I don’t know. A real smartass might reply to that with, “Garbage in, garbage out.” But Elvis also said that the only thing he got any enjoyment out of was food. That makes me want to (posthumously, obviously) stay off his back about it. If what Elvis ate was a major factor in his early demise I hope it was worth it. Maybe it was. I wouldn’t necessarily want to eat like this all the time but, for one day, it was good to be The King. Honestly, the only negative to come out of this little experiment is that I'm kind of baconed out. I went full Elvis today: Bowls of bacon all over the house. All. Over. The. House. Now there's only one bowl left. I can't say I'm exactly looking forward to my bedtime snack.